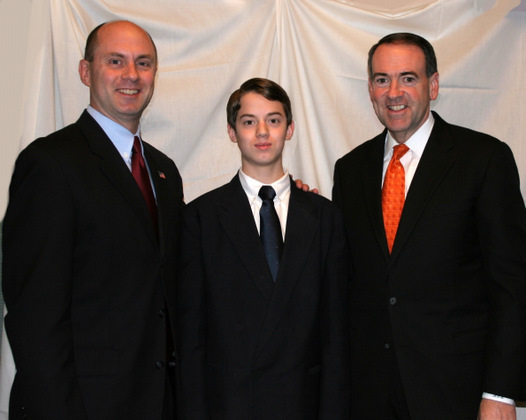 Former presidential candidate and Arkansas Governor Mike Huckabee Wednesday announced his endorsement of Gary Glenn in the Republican primary for U.S. Senate in Michigan. "I am very happy to endorse and support Gary Glenn for the United States Senate in Michigan. Gary is a person whose clarity of conviction is refreshing. He has boldly led on issues of life, traditional marriage, and the Fair Tax. When I needed help in Michigan in 2008, Gary didn't wait until it was convenient or popular, he stood with me out of sheer courage of his views. Gary Glenn won't take a poll to find out where he needs to stand. He will be a Senator that will take his values with him to Washington. I hope you will join me in getting behind Gary with your prayers, your generous and sacrificial contributions, and your vote." "The support of a person of Gov. Huckabee's character, leadership, and values is humbling and certainly encouraging, and it's reflective of the grassroots groundswell my candidacy is winning from Tea Party and other conservative activists in the Republican primary," Glenn said. "No Republican who doesn't have the enthusiastic support of Tea Party and conservative grassroots can defeat Sen. Debbie Stabenow," Glenn said. "And when conservatives learn about Pete Hoekstra's vote for the Wall Street bailout, debt ceiling increases, and Brady Bill gun control law, and his long record of association with Jimmy Hoffa and opposition to state and national Right to Work laws, they will not support him." Glenn, who was a featured speaker at the first Tea Party rally in Midland County in April 2009, has won support from Tea Party activists across the state. Last month, in the only campaign event in which all GOP candidates for U.S. Senate have appeared together, Glenn won a straw poll immediately following a candidate forum in DeWitt sponsored by three mid-Michigan Tea Party groups with an audience of 500 attendees. Glenn won 32 percent of that straw poll, defeating former Congressman Pete Hoekstra (23 percent) and charter school founder Clark Durant (18 percent). Three other candidates won support in single digits. Glenn, for 12 years the president of the American Family Association of Michigan and co-author of the state Marriage Protection Amendment approved by voters in 2004, supported Huckabee's 2008 presidential campaign and was a Huckabee alternate to the 2008 Republican National Convention.